It's been about five years since we've heard a peep out of Aussie pop princess Delta Goodrem, but at long last, the wait is over. "Sitting On Top of The World" is the 27 year old singer/songwriter's brilliantly concocted comeback single, destined to be a smash in her native Australia and hopefully the rest of the world. Released in Australia and New Zealand April 13th, this up-tempo drop of liquid pop gold was co-written by Goodrem and Grammy-winning producer John Shanks (Michelle Branch, Sheryl Crow, Celine Dion), who also served as producer on the track. The song is the lead single off Goodrem's upcoming fourth studio album, due out later this year on Sony Music Australia. Already a bonafide star down under, Goodrem has yet to really "crack" America, so here's the rundown on this impressive Aussie's career up to now. Signing to Sony at the age of 15, it wasn't until after she landed a role on the popular Aussie soap, Neighbours, that her pop career really took off. Neighbours is a who's who launchpad for success in Australia, kick-starting the careers of pop stars including Kylie Minogue, Holly Valance, Jason Donovan, Natalie Imbruglia to name a few. In 2002, Delta premiered her single, "Born To Try" on the popular soap, catapulting the beautiful piano ballad to the #1 spot on the ARIA Singles Chart. Not only did Goodrem's third single, 2003's "Lost Without You" hit #1 in her native Australia, it also became her second top 5 hit in the UK, peaking at #4. Delta Goodrem's debut album, Innocent Eyes went on to debut at #1 in Australia as the highest selling album of 2003 and an impressive #2 in the UK. In total, the album spawned five #1 ARIA singles and three top ten UK singles. Not at all bad for a singer-turned-actress-turned singer. Shortly before the release of her fifth single, "Not Me, Not I," Goodrem was diagnosed with Hodgkin's lymphoma and was forced to put her career on hold while undergoing treatment. Shortly after treatment started, Goodrem was nominated for several ARIA Awards, picking seven prizes including one for "Best Female Artist." During the ceremony, Savage Garden front man and solo artist Darren Hayes performed a touching rendition of her hit single, "Lost Without You," dedicating the performance to his ill pop contemporary. In late 2003, after announcing that she was in remission, Goodrem started work on her sophomore album, Mistaken Identity, releasing it in November of 2004. Lead by Goodrem's sixth consecutive #1 single, "Out of the Blue" the album debuted at #1 on the album chart. Over in in UK, the album campaign was not nearly as successful as Innocent Eyes, with "Out of Blue" peaking at #9 and the album stalling out at #25. With the release of her third single, "Almost Here," featuring then-boyfriend Westlife's Brian McFadden, Goodrem gained back some traction on the UK Singles Chart, peaking at #3. In 2007 Delta released her third studio album (and third #1), Delta. The album's first single, "In This Life" went on to debut at #1, becoming the star's eighth #1 ARIA single. Follow up single, the excitingly dance-able "Believe Again" peaked at #2, while similarly titled third and fourth singles, "You Will Only Break My Heart" and "I Can't Break It To My Heart," peaked at #14 and #13 respectively. Not nearly as potent on the charts as she used to be, Goodrem released no further singles. While Delta did release a remixed/re-recorded version of her 2003 hit "Lost Without You" for the American market in 2005, seeing it peak at #18 on Billboard's Hot Adult Contemporary Tracks chart, it wasn't until three years later that she actually started promoting here. In 2008, Goodrem returned to America, stopping at radio stations all across the country to promote her debut U.S. single, "In This Life," even making her U.S. television debut on The Late Show with David Letterman. Admittedly, I was pumped when I heard Delta was scheduled to appear in Boston for a free performance, however she backed out inexplicably - something I'm still a little bitter about to be honest. Delta released her U.S. version of the album through Decca Records in July of 2007, seeing it peak at #1 on Billboard's Top Heatseekers chart and #116 on the Billboard 200. Today Delta can be seen on the Australian version of The Voice as a coach/judge alongside fellow coaches Keith Urban, Good Charlotte's Joel Madden and Seal - watch this trailer teasing the show's debut season. 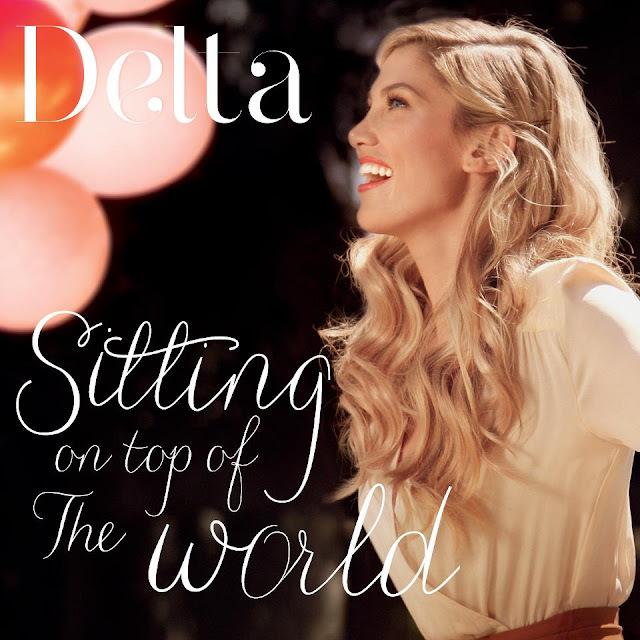 Delta can also be seen in the happy-go-lucky video for Goodrem's brand new single, "Sitting on Top of the World" (BELOW), featuring a fun choreographed number, lots of colored balloons and a RAVISHING-looking Goodrem showing off her mad piano skills in front of a beautiful plantation house. The sunshiny vibe of the video serves as the perfect complement to the song, on which Goodrem's impressive vocals have never sounded better. It's good to have you back Ms. Goodrem. Download "Sitting on Top of the World" on Australian iTunes HERE and check out a selection Delta Goodrem's music in the UK and U.S. BELOW.